The situation: In our application there're several actions once done that will cause the data loss or won't be able to be undone. So, we ask users whether they are sure of what they are doing before completing the action. Which way to ask this is better? I'm a bit lost here. The first option seems a bit excessive but the second one in its turn seems a bit abrupt. Which style should I follow? Maybe you have some better suggestions? Examples: 1) Are you sure you want to delete this task? You will not be able to undo this action. 2) Delete this task? You will not be able to undo this action. 1) Are you sure you want to delete this post? You will not be able to undo this action. 2) Delete this post? You will not be able to undo this action. 1) Are you sure you want to undo this activity? You will not be able to undo this action. 2) Undo this activity? You will not be able to undo this action. I would not ask the user if he's sure, i would assume he is and explain him his actions. 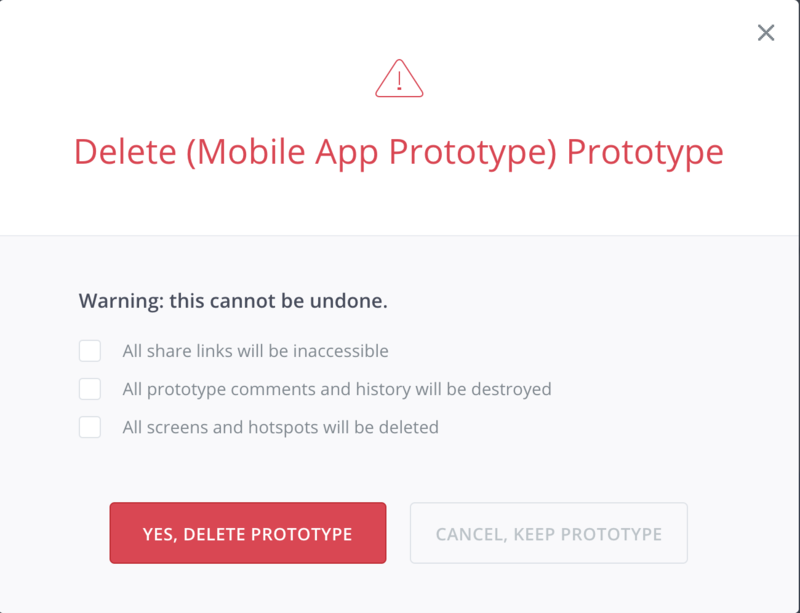 I like invisions approach, they even added checkboxes so they make 100% sure that if you delete you delete because you want to delete and are 100% sure what this means. Of course for smaller actions or actions that get used frequently checkboxes could be annoying since it slows down task-completition but for more critical actions i would follow this approach. The buttons should always display the action the user is about to do. "Yes, delete task", "Cancel, keep task"
I personally hate "are you sure"s. For example: when copying files I'll get an overwrite/skip option; if I select overwrite, I don't want to be asked if I'm sure — since it's all too easy to click "overwrite" then automatically "Yes" (because I've done that so many times). The only safe way is to make sure FIRST and THEN click overwrite — and if I do it that way, there's no need to say yes, is there? Sometimes they'll be a "don't ask me again" message, which is nice, but what I hate even more than "are you sure" is an option to "don't ask me again" — and you don't know what you will get if you select that — don't ask me again and always overwrite, or don't ask me again and always skip. I avoid that like the plague. There are some better examples out there, I just can't think of them at the moment. You can use the approach Google uses. They let the user perform the action with the feedback alert on the top where the user can undo the action. Not the answer you're looking for? Browse other questions tagged interaction-design popup actions warnings or ask your own question. Focus the form and block anything else? What order should a dialog boxes options appear in?